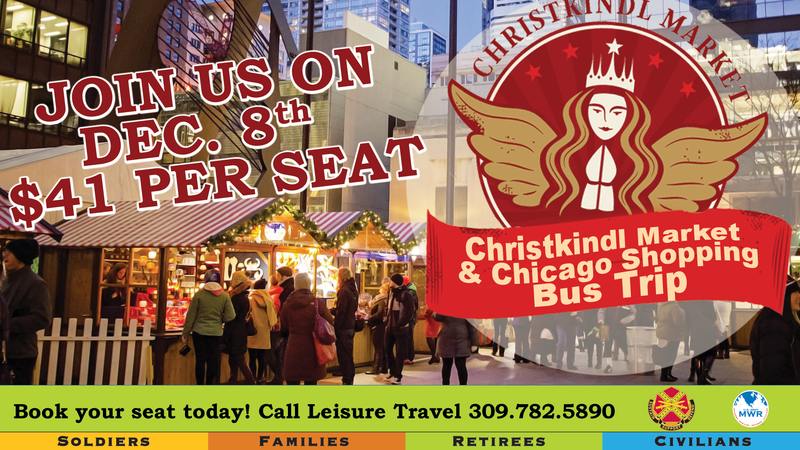 Date: Dec 8 2018, 6:30 a.m. - 8 p.m.
Join MWR for a bus trip to the Windy City for the annual Christkindlmarket to kick off your holiday shopping. Learn more about the market on their website: http://www.christkindlmarket.com/ Cost is $41/person. Bus will depart from Memorial Field Pavilion on Rock Island Arsenal at 6:30 a.m. and will leave Chicago at 5 p.m. Please call +1 (309) 782-5890 for more info and to reserve your seats by November 8th.